Scottish National Portrait Gallery Performance Script – 27th Feb 2016 – BP or not BP? Exec 1 : Gather round! Gather round! Do have a look at these beautiful paintings! Welcome to our new Artwash wing! Welcome all. Exec 2 : We’re here today from BP, to show you a selection of beautiful portraits we have sponsored, to enhance our reputation and boost our social responsibility, OK? Exec 2 : [To Artist 1] Now, what have we here? Would you like to show us what you are painting? Artist 1 : [Turns around picture to show Deepwater Horizon exploding] This is a painting of Deepwater Horizon, BP’s offshore oil rig, exploding. The explosion killed 11 BP workers and spilled millions of barrels of oil into the Gulf of Mexico. It was the largest environmental disaster in US history. Exec 2 : [false smile wavers a little, but still fake-ly polite, patronising] Goodness me! Why have you painted that? Now, that’s not the sort of picture we want to be painting of ourselves, is it? Exec 1 : [Snaps, nasty] That’s enough!…. [Exec 1 takes her arm. She rearranges features into a smile]…of that. That’s a wee bit negative don’t you think? I don’t think the people of Scotland want to be upset by the paintings do they? No. Exec 2 : I know what you can do! Why not paint some nice white wings so the bird can fly away? Because we did clean up the spill, didn’t we Exec 1? Exec 2 : Just paint the wings! Now, next painting. What have you got for us? Artist 3 : What are you doing? Exec 1 : Here Exec 2, let’s stick these *flowers* over it [starts sticking the BP logo all over the painting]. That’s much better! Exec 2 : [Over her shoulder] And put a nice green wash on it too! Exec 1 : Aha! Here’s a portrait! Much better than all this tree-hugging stuff. Who have you painted? paramilitaries who were paid to provide ‘security’ for the pipeline by the Colombian Government and Ocensa. He made it out alive, but thousands of others did not, including his friend and fellow union activist Auri Sara Marrugo. BP was part of the multinational oil consortium OCENSA SA, which paid 46,000 dollars on Gilberto’s kidnap, torture, and attempted murder and disappearance. Gilberto is now taking BP to court for its role in these human rights abuses. Exec 1 : I’ve never heard of him in my life! This has nothing to do with BP! Exec 2 : [smiley] Next time, paint something with some happy people, won’t you? [slaps the BP logo over the face on the portrait. They move away, artist peels off the logo, puts it on the floor and stamps on it]. Exec 1 : Now, our final artist. I’m sure you’ve painted something nice haven’t you? Exec 1 : No, no, no, no, NO! This isn’t what we want the public to hear! Exec 2 : The whole reason we’re funding the arts is to improve our image! Artist 4 : But this is the truth! Narrator : Not so fast BP! Do you think you can get away that easily? ecosystem and people’s lives! You have been charged with a 20 billion dollar fine, making you the world’s largest corporate criminal! You’re trampling over the rights of indigenous people, and propping up regimes that have committed terrible human rights abuses! There are frontline communities all around the world, from Azerbaijan to Australia, who do not want you on their land! And you’re polluting the entire planet by continuing to explore and exploit ever-dirtier fossil fuels! 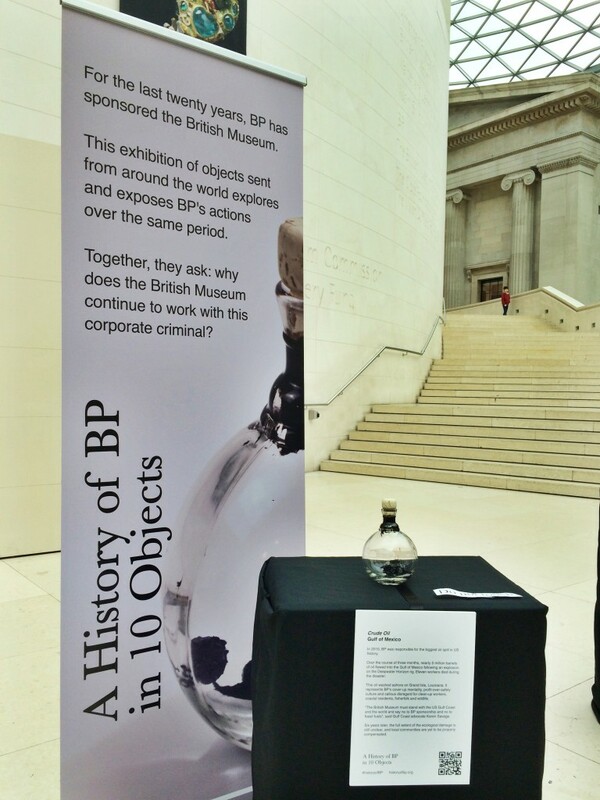 [to the audience] Do you think BP should sponsor the Portrait Awards? Ensemble : [in the Audience] NO! Narrator : You try to cover up your dirty dealings with a pretty sunburst logo, plastering it all over our museums and galleries, using their good reputations to curry favour! But really you are oil-stained, tar-smeared rogues! [Points to the portrait of logo artist has brought out] [To audience] Do you think the Scottish National Portrait Gallery should allow BP’s logo within its halls? Ensemble : [in the Audience] NO! Narrator : [to the Audience] It’s up to you – if you think BP does not have a place in the Arts in Scotland, then tell the National Portrait Gallery! Fill in a feedback form, or sign our petition. Ensemble : We love the arts! Narrator : We love the environment! Ensemble : We love the environment! Narrator : We are going to remove Ensemble : We are going to remove Narrator : BP from this Gallery! Ensemble : BP from this Gallery! Narrator : [points to execs] Leave now BP! Ensemble : Leave now BP! Artist 1/2/3/4 : Come on, there’s loads of renewable energy you can invest in! And we will not be silent!